Barcelona are now 10 points clear of Atletico Madrid at the top of the table. 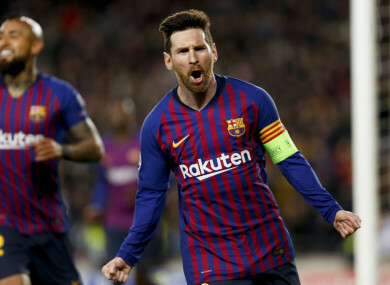 LIONEL MESSI BROKE yet another Barcelona record as he scored a stunning hat-trick in a superb 4-1 win at Real Betis, sending Ernesto Valverde’s men 10 points clear at the top of La Liga. Loren scored a late consolation for Betis after a pass from fellow substitute Diego Lainez, but Barca’s lead atop La Liga increased and Messi was left to celebrate another record after completing his treble with a outrageous chip that clipped the crossbar as it beat Lopez. Email “Lionel Messi scores sensational hat-trick to send Barcelona 10 points clear in La Liga”. Feedback on “Lionel Messi scores sensational hat-trick to send Barcelona 10 points clear in La Liga”.